BANGKOK — Stock markets mostly dipped on Thursday on the news that some policymakers at Federal Reserve think interest rates should continue to be raised until they are slightly restrictive. KEEPING SCORE: Germany's DAX shed 0.1 percent to 11,704 and the CAC 40 in France gained 0.4 percent to 5,163. Britain's FTSE 100 was down 0.1 percent to 7,048. The future contracts for the Dow Jones industrial average and for the S&P 500 were both down 0.4 percent. FED TALK: The Federal Reserve's minutes from its meeting in late September, when it raised interest rates for the third time this year showed some participants thought the Fed's key interest rate would eventually need to "become modestly restrictive" to ensure inflation doesn't climb too high. Other officials felt the Fed shouldn't take that step unless there are signs the economy is overheating and inflation is rising quickly. Higher rates can slow growth and the easy credit that has helped fuel stock markets in recent years. CHINA'S CURRENCY FALLS: China's politically sensitive yuan fell to a 22-month low against the dollar after the U.S. Treasury declined to label Beijing a currency manipulator. The yuan fell to 6.9411 per dollar, the closest it has come to breaking the symbolic level of seven to the dollar since December 2016, but recovered slightly in the afternoon. 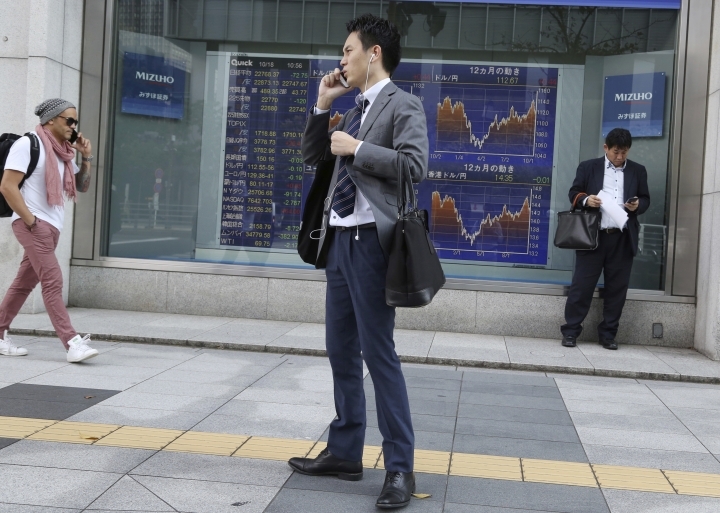 JAPAN TRADE: Japan recorded a trade surplus for September of 139.6 billion yen ($1.2 billion), but exports fell 1.2 percent from the previous year in the first decline for the world's third largest economy since 2016. A series of natural disasters took a toll, but the lag in exports also reflects uncertainties over trade tensions after President Donald Trump imposed penalty tariffs on billions of dollars' worth of Chinese exports. 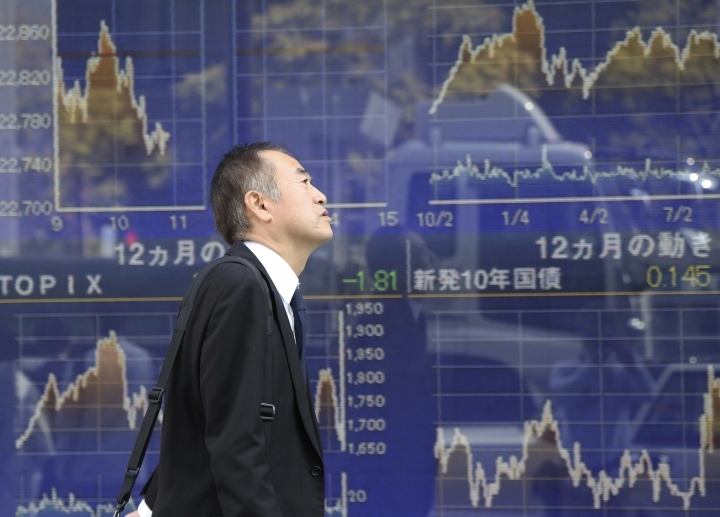 ASIA'S DAY: Japan's Nikkei 225 index sank 0.8 percent to 22,658.16 and the Kospi in South Korea lost 0.9 percent to 2,148.31. Hong Kong's Hang Seng index was almost unchanged at 25,454.55 and the Shanghai Composite index tumbled 2.9 percent to 2,486.42. Australia's S&P ASX 200 reversed losses to gain 0.1 percent, ending at 5,942.40. 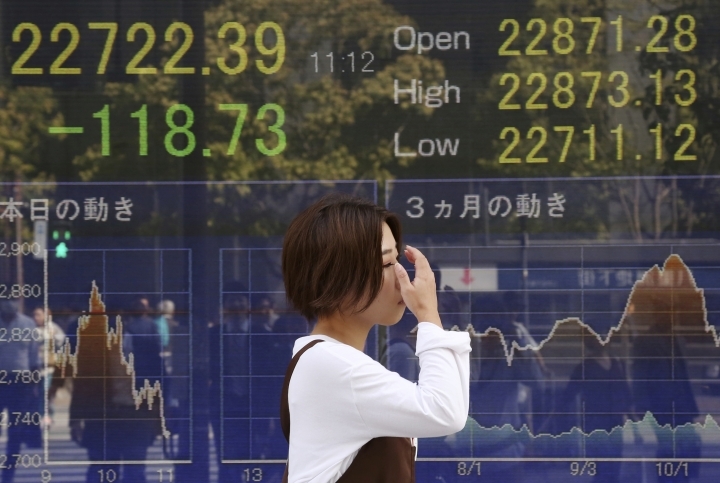 Shares fell in Southeast Asia and Taiwan. ENERGY: The price of U.S. crude oil lost 97 cents to $68.78 per barrel in electronic trading on the New York Mercantile Exchange. Brent crude, the international standard, lost $1.26 to $78.79 per barrel. 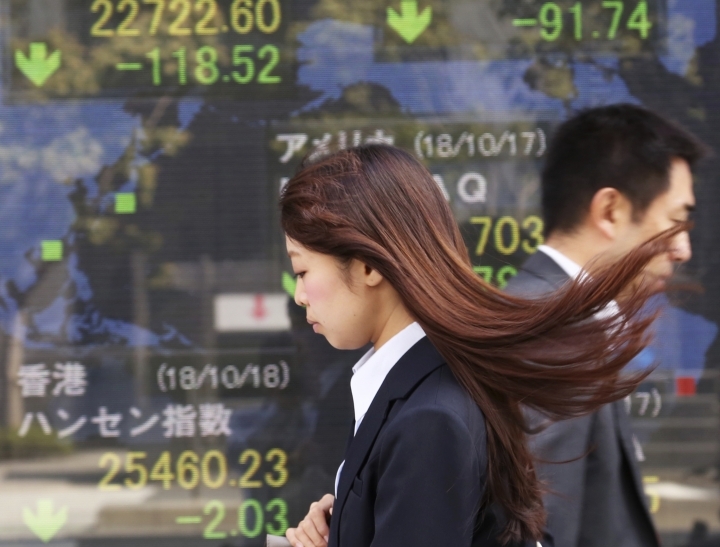 CURRENCIES: The dollar fell to 112.52 yen from 112.66 yen. The euro fell to $1.1508 from $1.1578.